I don't ever need a particular reason to revisit Casablanca. Bogart's stoic cool, the quotable lines, and "As Time Goes By" are all reason enough. But, as this weekend marks the film's 75th birthday, I felt a special responsibility to watch it again. 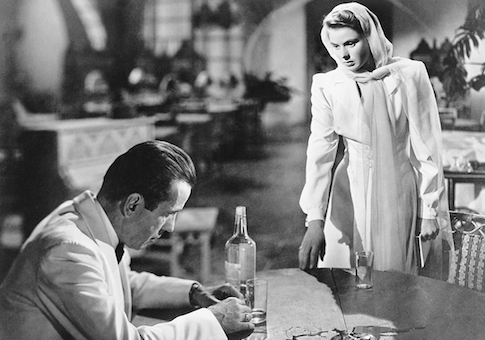 If you've never seen Casablanca before, there is no time like the present. It is no exaggeration to say Casablanca is one of the greatest films ever made. It won three Academy Awards (Best Picture, Best Director, and Best Adapted Screenplay), and holds a high 97 percent on Rotten Tomatoes, which ought to tell you two things. 3 percent of critics who reviewed it should never be allowed to review another film. Repeat viewings lead to a deeper appreciation of the movie. While the first time around you might pay attention to only the superficial love story, by the second and third and fourth viewings the sub-textual politics have moved to the fore. The intellectual nature of the film is part of its longstanding appeal, with its philosophical elements incorporated with deftness missing in much of modern screenwriting. Much has been written about Rick Blaine as an isolationist, a man who says he'll "stick [his] neck out for nobody," but ultimately learns that such a policy is unfeasible. Because the film was produced, released, and set during the early years World War II, Rick is often interpreted as a stand-in for the isolationist United States prior to the Pearl Harbor attack. A character in the film rather explicitly says at one point, "My dear Rick, when will you realize that in this world today isolationism is no longer a practical policy?" When we're first introduced to him, Rick seems like a protagonist from an Ayn Rand novel. He is a business owner who prefers to keep to himself and resists government attempts to influence him. He's also a debonair individualist who takes what he wants from life. But Rick's decision to prioritize the needs of community over his own desires would have had Rand storming out of the movie before the Rick and Louis even began their beautiful friendship. Rick is by no means a bad person. He's even shown to be rather admirable at times, like when he helps a recently married couple make enough money to purchase tickets out of Casablanca. But he has, quite certainly, given up on the world. He's nostalgic for a past he doesn't think he can regain. He holds his own set of beliefs regarding right and wrong and seems to live by some moral code, but he's perfectly content to let the world crumble, as though fighting to maintain civilization and order are only prolonging humanity's suffering. Of course, in the end he changes his mind on the matter, deciding it is just, even to lose, if you are fighting for a righteous cause. Plus, as he's reminded at the end, the good guys might even win.